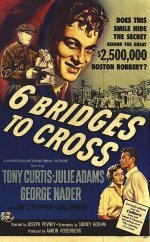 In the 1930s, newly minted Boston policeman Eddie Gallagher (George Nader) breaks up a robbery by a group of hooligans led by Jerry Florea (Sal Mineo). Though Eddie shoots and wounds Jerry in the process, the boy later comes to him to provide a tip on another robbery. Over the years, the two develop a relationship in which Eddie guides Jerry, who struggles to reform. When the adult Jerry (Tony Curtis) hopes to enlist in the Army, he is prevented by his criminal past, until Eddie lends a hand.